If you have detected the program called Edu App on your computer, you should remove it as soon as possible because it will not do anything good for you. According to the specialists working at pcthreat.com, Edu App is a typical advertising-supported application, so the only thing that it is going to do is to show various commercial advertisements. They will appear on your screen no matter which browser you use because Edu App is compatible with all the most popular browsers. If you have already seen advertisements on your screen and want to remove them all, you have to delete Edu App. Continue reading this article if you want to find out how to do that. We suggest that you remove Edu App as quickly as possible because this program might cause harm to your system. Even though the application itself is not very harmful, it generates advertisements that might take you to corrupted websites. Of course, not all the ads will cause harm to your system if you click on them; however, it is impossible to say which ads can be trusted and which cannot, so you should ignore them all. You should not forget that there is always a possibility for clicking on advertisements accidentally, so we recommend that you remove Edu App entirely in order not to see the advertisements on the screen ever again. Advertising-supported applications, especially those published by SuperWeb LLC, might enter your system without your permission because they travel bundled with other applications in most cases. 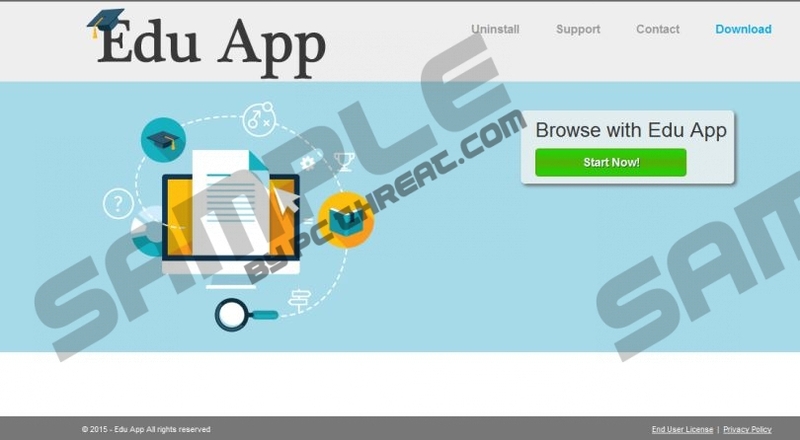 Users are usually informed about the installation of Edu App; however, they frequently do not notice that and so agree with the installation of this adware. You can prevent malware from entering your system in the future. All that you have to do is to install an antimalware tool on the system and surf the Internet more carefully. You should remove Edu App as quickly as possible because this program is not trustworthy and it might even cause harm to your PC. The easiest way to remove this program is to scan the system with SpyHunter or a similar antimalware tool. Of course, you can also remove Edu App manually. In order to help you do that, we have prepared manual removal instructions, which you will find below this article. Make sure that you follow the removal steps exactly as written in order to fully remove Edu App. Actually, after the manual removal of Edu App it would be wise use an automatic tool to check whether the system is really clean. Quick & tested solution for Edu App removal.